New Delhi/Bangalore: The protests against the 2,500 megawatt power project his son, Darshan, was developing in Maval, Pune, were only to be expected in a country where such activism is common, but the use of high-profile lawyers by the protesters wasn’t, and so real estate tycoon Niranjan Hiranandani filed a complaint with the Mumbai police’s crime branch, airing his suspicions. On 3 December, Mumbai Mirror, a tabloid, published the findings of the investigation that alleged that Priya Hiranandani-Vandrevala was orchestrating the protests. The findings of the investigation make up the latest chapter in a bitter battle that started a little over a year ago when Vandrevala sought arbitration under a business association agreement (BAA), which she claims was violated jointly by her father and brother, resulting in losses to her. Besides a property in Dubai, the disputed assets include 28 other projects spread across India. The arbitration proceedings, filed in October 2010, immediately gained a high profile after Cherie Blair, wife of former British prime minister Tony Blair, a counsel for the Queen and senior arbitrator, was chosen as the chief arbitrator on the panel. Other members include former chief justice of the Delhi high court, Ajit P. Shah, and Lucy Reed, another Queen’s counsel from the UK. London-based Vandrevala, 34, initiated the arbitration proceedings based on the BAA she had with her father and younger brother. The May 2006 BAA required that all business transactions to develop and acquire property be undertaken exclusively with each other for the first seven years. The profits were to be shared equally between Vandrevala and the Hiranandanis. The Hiranandanis have made a counter claim, arguing that the dispute had caused a loss of business opportunities for them. The exact numbers have yet to be calculated because both claims include in futuro claims, or claims on income that could have been earned. The family travails have largely followed the ups and downs of Vandrevala’s relationship with her parents and sibling. Till 2002, their relationship was amicable. This was during her first marriage to Samir Gupta, a chartered accountant. After things didn’t work out with Gupta, she moved to the US, where she met her current husband, Cyrus Vandrevala. Priya’s ties with her parents became strained after the dissolution of the first marriage. The relationship with the family was re-established after she had two children with Cyrus. Bonds became stronger when Priya oversaw her father’s convalescence and return to good health after he underwent treatment in the US. At the end of 2004, Priya, also a trained chartered accountant, was given charge of a software venture, Hiranandani Software and Systems Pvt. Ltd, owned jointly by her father and uncle Surendra, and which was worth Rs16.5 crore. She revived the company, rechristened it Zenta India Pvt. Ltd, and sold it for Rs427.9 crore by May 2005. Having proven her ability, Priya expressed her desire to join the her family’s primary business—real estate. The Hiranandanis and Vandrevala floated Hirco Plc. in London in 2006 and created a subsidiary, Hirco Developments Pvt. Ltd (HDPL), to develop large townships in India. In 2007, Firdose Vandrevala, uncle of Cyrus Vandrevala, a high-profile former Tata group and Motorola executive (he had been chairman of Tata Teleservices, managing director of Tata Power, deputy managing director of Tata Steel, and chairman of Motorola India), was appointed HDPL’s chairman and managing director. In 2005, the Indian government allowed 100% foreign direct investment in the housing, real estate and townships sector. Once Vandrevala entered into the agreement with Niranjan and Darshan Hiranandani, she and Cyrus Vandrevala started raising money for investments to be made for developing townships in India. And the Hiranandanis began buying land for the projects. Under the agreement, Vandrevala was to raise “monies for investment", Niranjan Hiranandani was to use his experience in the real estate sector to develop the projects, and Darshan Hiranandani was to work on procuring the requisite clearances for the projects. This money was routed through Hirco. Hirco had launched the largest initial public offering on the London Stock Exchange’s Alternative Investment Market in 2006, raising £383 million. In 2007 and 2008, it earned profits of £107 million and £75 million, respectively. However, the company posted losses of £17.75 million and £13.56 million in 2009 and 2010, respectively, coinciding with the phase when things started going downhill between Vandrevala and the Hiranandanis. Property advisory CB Richard Ellis (CBRE) valued Hirco’s Indian property investments on 30 September at £343 million (Rs2,857.88 crore today). The £343 million figure comprises a development at Panvel, Mumbai, that CBRE has valued at £217 million, and another at Chennai that CBRE has valued at £126 million. The genesis of the fallout can be traced to 2009, when Vandrevala wrote to Niranjan Hiranandani, voicing concern about properties continuing to be acquired in India. She believed that these acquisitions were being made under the terms of their agreement and was concerned that she was not profiting from them. Niranjan Hiranandani wrote back saying that if she wanted to see returns from the sale of project land, she would have to fund half the cost for developing it. As far as he was concerned, much of the land he was buying was outside the terms of the agreement. This snowballed into a full-fledged legal battle. Vandrevala claims that her father and brother entered into projects without her knowledge, either independently or with others in the real estate sector, despite signing the BAA to do business exclusively with her. Niranjan and Darshan Hiranandani initially denied the existence of an agreement between the three of them, claiming they were not fully aware that this was to be the nature of their relationship. They maintained that they were not aware as to where and when the BAA was executed. Cyril Shroff and his firm, Amarchand & Mangaldas & Suresh A. Shroff & Co. prepared a draft of the BAA. Niranjan and Darshan Hiranandani claim that the meetings held to prepare this draft were of an informal nature as Niranjan and his father, Lakhumal Hiranand Hiranandani, are socially known to Shroff and his family. The Hiranandanis claim that Shroff’s firm represented only Vandrevala’s interests “in drafting and in settling" the agreement. According to their statement of defence, they didn’t see the May 2006 agreement with Vandrevala till 17 May 2009, until it was emailed to them, and therefore could not be bound by the obligations of the agreement. The arbitration hearings were to be held in December, but due to the initial denial of the existence of the agreement by the Hiranandanis, they will now be held in 2012. Currently, the two sides are framing their respective strategies. The Hiranandanis maintain that the main reason for Vandrevala being able to raise money abroad was because of her association with the Hiranandani brand. Niranjan Hiranandani founded the Mumbai-based Hiranandani group, mainly as a real estate business, along with brother Surendra Hiranandani in 1978. In a telephone conversation, he told Mint that the dispute should be resolved in the next few months. Niranjan said the arbitration proceedings and the Mumbai police crime branch inquiry were completely unrelated in nature. “I had no clue that Priya or her husband could be behind this, as reports indicate when I asked for an inquiry into the matter. I thought it was a result of corporate rivalry." “While the arbitration case is claiming money, this case is of a different nature and I am very embarrassed by it," he said. Vandrevala remained unavailable for comment, despite repeated efforts to reach her. In August 2010, Hirco’s shareholders were informed that no dividends would be paid before 2013. In September that year, following a review of its strategic direction, the company announced a streamlining of the board. Priya, Sir Rob Young and Nigel McGowan left their posts within the company. However, Priya, who was chief executive, would continue to be a consultant. 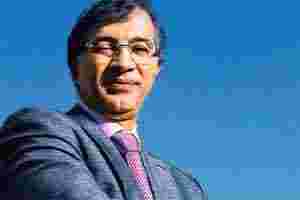 Niranjan Hiranandani resigned as non-executive chairman from the Hirco board in December 2010 after the Central Bureau of Investigation started looking into allegations of irregularities in the handling of employees’ provident funds for his Indian companies. This development does not appear to be related to the dispute in arbitration. “Previously, the Hirco board had been informed that there were legal disputes between constituent elements of the family and that the family had agreed to enter into arbitration. Consequently, the board sought assurances from the family that the legal disputes did not concern the business, assets or investments of the company. Such assurances were given by the family together with undertakings to keep the board of Hirco updated," said a Hirco statement at an annual general meeting earlier this year. Mint spoke to senior real estate consultants familiar with the development. They declined to be named, citing the sensitivity of the matter. “As a development company, Hirco group has a lot of potential and they have acquired land parcels that are competitive. The Hiranandani family, having developed Hiranandani Gardens in Powai, Mumbai, knows the business of building townships," said one consultant. A mid- to long-term impact of the dispute may be that Hirco may find it difficult to raise capital in future. To a large extent the outcome would be influenced by the settlement in arbitration, say analysts. “It will not have much impact on the core business of Hiranandani Developments, which is looked at by Niranjan and Darshan," said one.